As has been noted by President of Ukraine Viktor Yanukovych, the current situation in the energy sector and the high price of Russian gas to Ukraine prompted the modernization of the energy and industrial complex in order to ensure the energy security of the country. In many areas of a transition to energy-saving technology. To perform these tasks, the regional authority Lugansk directs all of the key enterprises in the region. Among them Lugansk Electrical Equipment Plant, which today with a press tour visited Lugansk journalists. The problem of energy conservation is extremely important for our region, which is traditionally industrial region, with production on our territory — mainly energy-intensive. To stabilize the situation, the leaders of the Lugansk region has a number of projects. Tak in Krasnodonskaya Antratsitovskogo and Lutuginskaya areas are built 3 wind farm with total capacity of 875 MW (in general, this will be the most powerful wind farm in Ukraine). Decentralization is also a large-scale thermal economy of cities and regions (already out of service for more than 260 unprofitable boiler, which made it possible for almost a third of the enterprises to reduce consumption of imported gas heating utilities). In addition, due to environmental investments implemented in the region of 40 projects worth about 250 mln. (They will reduce energy consumption from 30% to 50%), etc. Important role in this work and Lugansky plays Electrical Equipment Plant ("LEAZ"), which systematically works on the creation of an innovative line of energy-saving technologies. Manufactured products are used to display the warmth and energy saving industrial and municipal facilities to a new level. Eit can be clearly seen in the regional STI clinic: after the introduction teplokommutatsionnoy savings on heating installation here was 50%. Thanks to the production of the factory a list of objects of Lugansk, which use energy-saving technology for the new generation added in the past year even the railway station and hotel, 2 dormitories Lutuginskaya specialized boarding school and the building of "first aid" in Krasnodon. A recent example — the Ice Palace in Luhansk will also be powered by an integrated transformer substation made to "LEAZ." As the chairman of the supervisory council, Mikhail Krimerman, they release a low-voltage devices up to 1000, as well as high — over 1000, heating equipment (electric, modular electric boiler, gas-burning devices, infrared panel), metal furniture and doors. "The use of our products can reduce energy costs by several times, lowering production costs, and also solves the problem of heat loss, it is relevant for both industrial as well as for the public sector", — he said. According to him, the company is actively involved in virtually all economic regional programs, including intraregional cooperation in the program, which was initiated and actively introducing today the chairman of the Luhansk Regional State Administration Volodymyr Pristyuk. Michael Krimerman stressed that today the company works to build capacity (the capacity of the plant can increase their 4-4.5 times), as well as on the development of new markets. "For example, we are preparing to open a representative office in Turkmenistan — shared plans for the chairman of the supervisory board. — At the same time, using intraregional cooperation, our factory hopes to "draw" on the market as a lot of Luhansk enterprises. " Recall that today PJSC "Lugansk Electrical Equipment Plant" — a modern enterprise, the powerful potential of which are the latest technological equipment, qualified personnel structure and advanced methods of production management. On the basis of the Law of Ukraine of 20.02.2003, № 555-IV «On Alternative Energy Sources" and the Order of the Cabinet of Ministers of Ukraine of 28.09.2006 № 502-p "On the transfer of settlements on heating with electricity," Lugansky Electric Apparatus Factory has developed: electric water heaters " Pendant "capacity from 3 to 120 kW; электротеплокоммутационную automated modular boiler capacity from 10 to 600 kW, and other equipment. 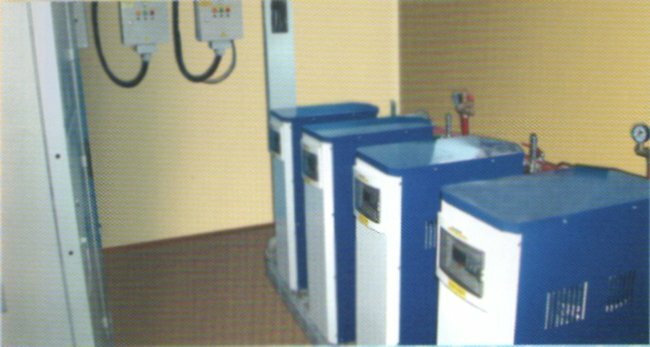 In March 2009, the decision of the Lugansk City Council approved target program "Alternative heat in the institutions of health and education Lugansk 2009-2013," in which the plant is being produced and will be the modernization of the existing inefficient boilers with boilers электротеплокоммутационных installing and upgrading of power supply objects with increasing power. By installing электротеплокоммутационной modular boiler plant integrated approach "turnkey": engineering and design, installation, commissioning, training, warranty and service. Their boilers feature: high efficiency (up to 99%), due to a new method of converting electrical energy savings of electricity consumed by the use of modern automation (digital programmers temperature), and multi-tariff meter, ecology — does not burn the oxygen out of the room, security — explosion-proof, can not be poisoned by carbon monoxide, do not need ventilation, in case of a leak in the heating system, the boiler automatically shuts down. Электротеплокоммутационные modular plants: developed on the basis of the boilers "Pendant" (high efficiency, economy, environmental friendliness, safety), does not require a separate room for the boiler, ventilation, safety equipment, there is no need to keep attendants (automatic support for setpoints) are easy to use, silent, the possible use of heat storage tanks to reduce energy consumption.